Our Most Popular Digital Hybrid. Broadcast Host turns your desktop into a professional broadcast center. Contains everything you need to get talk show quality phone recordings into your mixer or sound card. Connect a mic and headphones for a simple broadcast back to the station. Already at the station? Use Broadcast Host in your newsroom to record high quality interviews. Or, you can upload your recorded interview to your podcast. 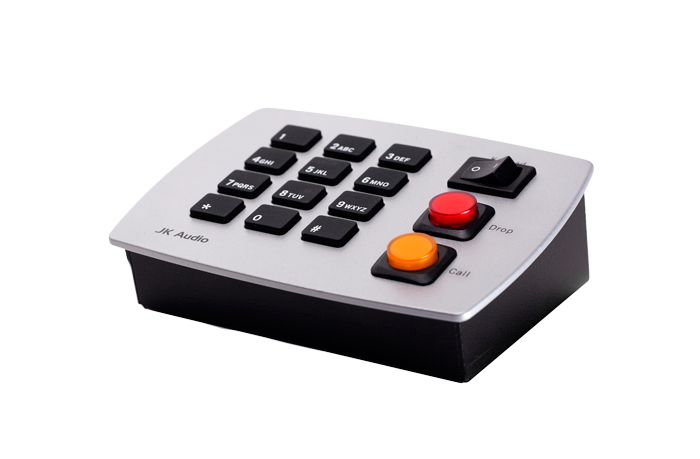 Broadcast Host allows you to send mic and line level signals into the phone line while maintaining excellent separation between your voice and the caller. The stereo output jack on the back of the unit provides your voice on one channel and only the caller’s voice on the other channel. The balanced XLR output jack contains only the caller’s voice. The digital hybrid connects audio signals to a standard analog telephone line without the transmit / receive crosstalk common to analog hybrids. The Digital Signal Processor (DSP) continuously monitors both the phone line and audio signals to deliver excellent separation. This proprietary, dual-convergence echo canceller algorithm can achieve excellent separation, typically exceeding 50 dB, without any setup and without sending a noise burst down the line. Broadcast Host provides connections for a microphone, headphones, mixer, sound card, telephone and your analog telephone line. An auxiliary telephone is only required to place outgoing calls. The auxiliary telephone is disconnected when you press the “Call” button, and reconnected when you press the “Drop” button. Broadcast Host features Auto-Answer/Auto Disconnect for use in IFB and monitoring applications. Other applications include: telephone interviews, talk shows, church PA interface, and conference room full duplex applications.